I just see 2 traffic cones. EDITY: I get the page today, rather than 2 orange traffic cones, maybe it was their version of a 502 or something. I found this website, www.backerkit.com, that tracks activity on crowdfunded websites like Indiegogo and Kickstarter. 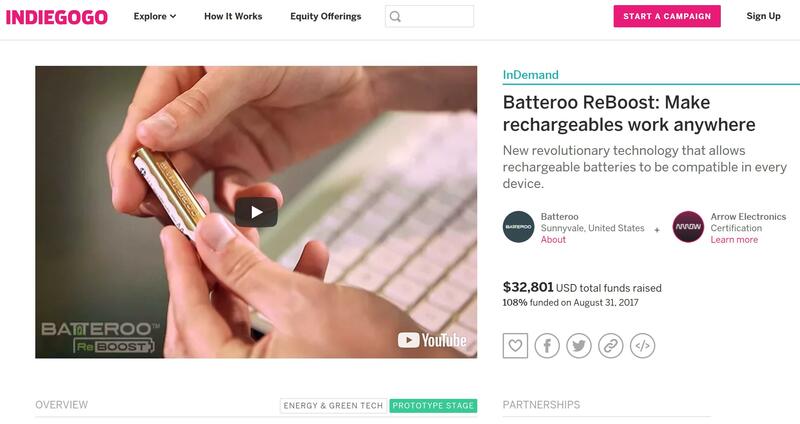 I am sure that Batteroo chose a relatively small target of $30K in the hope that would blew the target out of the water. Telling investors that Indiegogo campaign met its goal of $30K after a 30day campaign, is not a very good story. I also believe that this product has a smaller addressable market, than the first product, alkaline batteries. I don't know how many people bother with rechargeable batteries. The reality is this "product" has no market, real or snake oil. Everyone knows that virtually every device on earth works fine with rechargeable batteries so the scam doesn't work. Pretty much. No surprises this one has done a lot worse than the previous one, it doesn't have the same "save the world" vibe and outrageous "800%" claims, and supposed surprising information that there is still energy left in dead batteries. People went "wow" at all that. No nearly the same "wow" factor with the new campaign, they will be lucky to reach their target. Something to start your day with a chuckle. WE ARE NOW OFFERING RECHARGEABLE BATTERIES AND RECHARGEABLE BATTERY CHARGERS! We are offering high capacity AA and AAA rechargeable batteries and our battery charger can recharge up to 8 batteries at once! Pairing ReBoosts with rechargeable batteries, what could be a better gift? With these high quality batteries and battery chargers that can charge so many at once, these products would be so useful for the people in your life who go through tons of batteries: new parents whose children use lots of battery powered toys, gaming teenagers who get frustrated at their console controllers dying so quickly, photography enthusiasts who need their nice cameras to last as long as possible, and so many others! Anyone who uses batteries could benefit from having Batteroo ReBoosts and rechargeable batteries in their life. 1. Basic Battery+Charger Bundle: $23 perk that includes 1x 4 pack of AA and 1x 4 pack of AAA rechargeable batteries, and 1x battery charger. 2. EB Complete Battery+Charger Bundle: $50 perk that includes 3x 4 packs of AA and 3x 4 packs of AAA rechargeable batteries, and 1x battery charger. Don't wait, our campaign is almost over! Check out the new perks here and don't miss out on your chance to get these great discount prices! I guess we now know who's got ties with The Big Battery. Unfortunately, it doesn't say what brand and model of the rechargeables they offer, but I doubt they offer Eneloops (that's the ones they show in their unrelated pictures), since the retail price for those would be close to $100. However, if they are offering Eneloops, it is a good opportunity for those that need some. All that being said, if they ship anything other then Eneloops, they might get into additional trouble since, based on other images, somebody could reasonably get the impression that they offer those, and get thoroughly disappointed once they receive some crappy Banggood grade cells. This is like Goodyear selling cars to go with their tyres. Yeah... But not constant current LED torches. They prefer to promote lame old incandescent ones. For the best performance, rechargeable AA batteries are not recommended. The problem they face is that people with rechargeable don't care how quickly they drain. They just pop them back in the charger. No extra gadget needed. There's really no issue with rechargeable batteries in the One controllers, I use them without issue in mine. This is just marketing b.s. Designed to push you into buying their expensive "charge and play" kit - they did the same with the 360 controllers. I bet 1500-2000$ gets thrown in any day now, or will they fail or canceled in the last hour? It is a "flexible goal" - so no failure or cancellation likely, as they are going to get all the funds already collected. And they'd be silly to throw in any of their own money to get it "over the line" as they'll just be paying extra IGG fees on that. It is clearly a flop whether they reach the $30k goal or not. No current or potential investor is going to be impressed. Nah, the missing amount will appear by a miracle. For Bob and the crew, this is really looking like a disaster. In the last campaign, for the batteriser (renamed Batteroo) they set the target at $30K and raised a respectable $395,149, 1317% of the goal. In the new campaign for the ReBoost, it looks like they will raise 95-105% of the same $30K goal. The money raised includes some shipping charges and the resale of some batteries and chargers. They now have to develop four products, AAA, AA, C and D versions of the ReBoost. They have also demonstrated, to potential investors, that there is very little interest in this product, and therefore further diminished the value of the company. I wonder how many people use their Batterisers on a regular basis? They must owe their mates about $25,000 by now! There have been no updates and very little activity in the comments. Is this still a "thing"? The company is totally on a death spiral now, their second best scam idea has flamed out in spectacular fashion. People that have popped for rechargeable batteries have already figured out they work in most things and simply recharge them when needed. Go figure. They just scrapped in on their target, not that the target mattered to a venture backed company with big money. They were no doubt shooting for a million dollar campaign, so this is nothing short of a complete flop. They would be making a big financial loss on this campaign. The company won't be in business much longer unless they get that big Kmart/Walmart order, investor patience will run out, they don't want this nickel and dime IGG rubbish.